It's time for Photo Art Friday again! Last week your submissions using the 'Leafy Landscape' texture were incredible!!! Viewing each other's work is truly a delight and can also be a great opportunity for learning and expansion of our artistic vision. So many of you generously share your photo art 'recipes' too, which fosters the learning opportunities. Thank you. Thank you. Thank you!!! This week the optional challenge is to create a piece of photo art about something 'derelict'. Of course, you are always welcome to share any piece of photo art you like, especially if you do not have the time or inclination to go with the challenge/prompt. The above piece of photo art was created using an as-yet-unreleased texture. The two derelict cars, with a shabby, abandonned set of what looks like Olympic rings, made for an interesting subject. The above abandonned building certainly qualifies as derelict. With the addition of a painterly texture, poster edges, and a touch of Orton Effect, I have easily turned a humdrum photograph into a little piece of photo art. 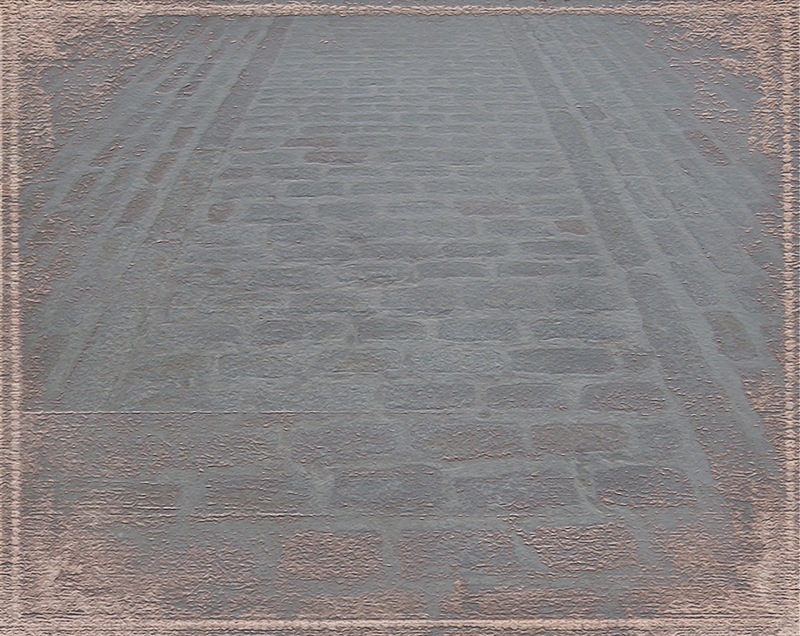 To download pdpa Cobblestone Road texture (for free!!!) click HERE. Please note that I refer to Cobblestone Road as a background, as well as a texture. You can use it as a texture if you are willing to use a layer mask to remove texture from the subject in your photo - however - it can be used very effectively as the canvas (background) on which you build a piece of photo ART using one or more of your photo images. This means that instead of applying the texture or background to your photograph, you apply your photograph(s) to the texture/background. As mentionned above, there will be lots for us to learn next week as we see all the different ways great creative minds use the background/texture. Can't wait!!! what I am noticing is that each week I learn more about what I don't know. last week and again this week you are referring to and USING a "texture" as a background. I don't quite follow that, although as a concept it seems straightforward, but I am just fine with what I don't know, with the growing number of things I don't know. I am fairly certain it is the terminology "layer mask" that is where my disconnect is. Anyway... I DO love the effect. what I DO know is that I cherish the weekends Now when I can marinate luxuriously through all the wonderful photo art here and really soak it in. I love that effect with the old buildings Bonnie, terrific! love your photo art pieces and your texture layers are beautiful as well~! i've been wondering the same thing that Currie asked . . . do i need to think about upgrading my elements program? i currently use 7 so maybe there's quite a bit more that the newest (11) can do. Your old buildings are gorgeous. Thank you for the new texture for next week, I can't wait to use it but it is midnight here and I must sleep! HOWEVER, I have not upgraded because I have installed Rita of The Coffeeshop Blog's Layer Mask Action for PSE. So even tho' I only have PSE 8 which comes with NO layer mask - I have installed the layer mask action from Rita. It appears right in my Effects Panel and with one click I have a layer mask applied to any layer. Layer Masks allow you to non-destructively (unlike erasing) remove unwanted part of an image (e.g. texture) from your digital composition. I could not do photo art to my satisfaction without access to a Layer Mask. YOU MUST GET ONE AND LEARN HOW TO USE IT! YOU WILL BE SO HAPPY ONCE YOU HAVE MASTERED USE OF THIS TOOL. There is a specific technique for installing Actions. You can find instructions for installing Actions by clicking the button to the effect that is right under The Coffeeshop Blog header. Her instructions are always concise and clear. An "Action" is a pre-set that gives you a several-step effect by clicking one button. Hope that helps and hope anyone with any further help will comment here so that everyone can benefit. Great challenge this week and your images are beautiful examples for the challenge. What is it about these old buildings and vehicles, etc. that are so intriguing? Next weeks challenge is certainly that!!! Not sure where I'll go with that one but it'll be fun. 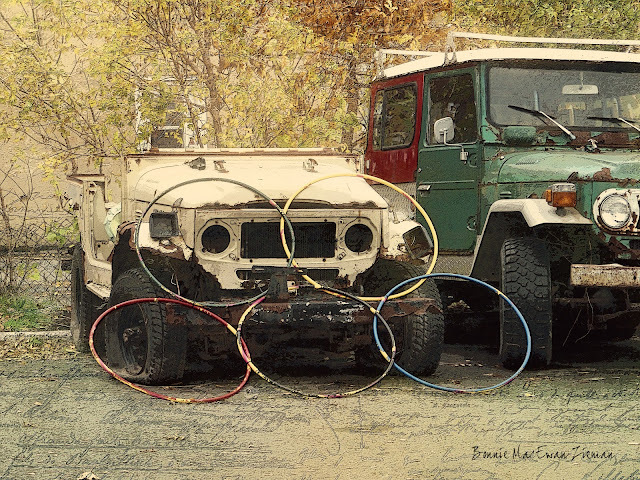 I'd love to hear the story of those abandoned rings! Great pieces. I really love the second one - that touch of Orton effect is wonderful. Fabulous pieces this week Bonnie. My favorite is the Old Building. What a great texture/background you've offered for next week. Thanks so much. Excellent work from you again Bonnie! I appreciate the conversation about upgrading..... I use PE 8 and have a new PE 10 still in the box (for more than a year, I think)....I won't do PSE because I think I have what I need. However, now there's a new PE 11, of course. I'm considering the upgrade, but dreading the moves that I'll have to make, also. 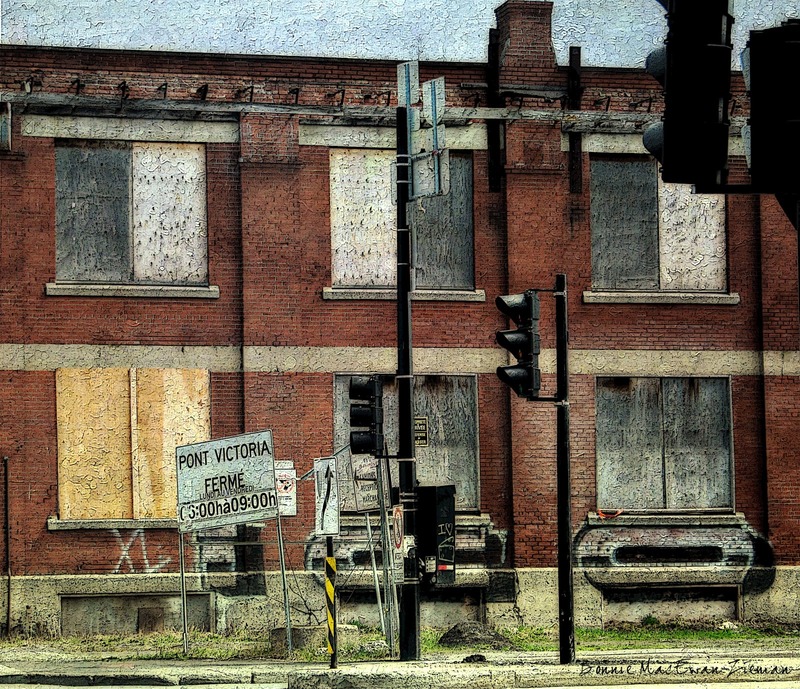 Bonnie...I really like your "derelict" images! Hi! Bonnie. I started to learn photography at Canon EOS school once a week. I will be able to take photos according your theme in a future. I love your derelict house - you've turned an ugly building into something quite beautiful! Interesting compositions, I love your textures maintained. Bonnie, the texture for next week looks very challenging! I hope I'll be able to play with it a little. The second shot in your post I think is wonderful. Love the processing you've done with it! I have another post for this prompt, hopefully. I started it and ran into a problem with my PSE. I hope it is okay to post twice. It will be later because I have run out of my free time, but I do want to post it. I love your Derelicts ... I love old things. They have such a nostalgia to them. Thank you for your imaginative prompts ... they keep my mind sharp and my creativity vigorous. p.s. thanks Boonie for the download - looking forward to creating with your cobbled street - a touch of nostalgia maybe. Your pics are "dream like"! I am enjoying seeing all the old stuff!!!!!!! Hi Bonnie, I really love what you have captured in your images... I am having such a blast each week now conjuring up ideas. It's given me a whole new meaning to sometimes routine days.. All of the images posted here are great and really stirs up inspiration. What a great challenge! 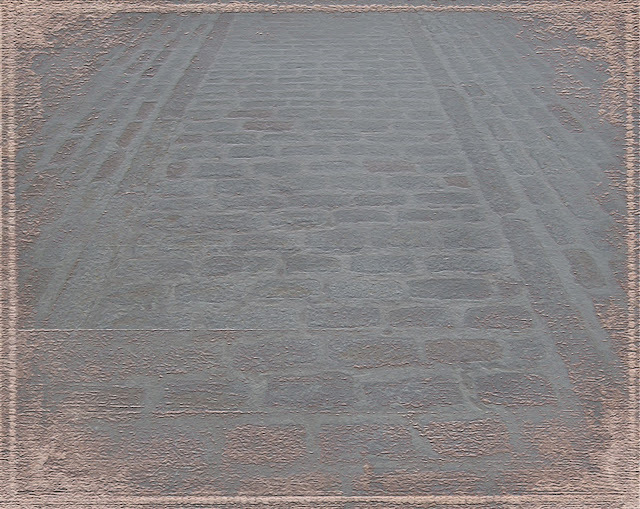 I need to get busy with this one...in the meantime I couldn't resist trying out the new cobblestone road texture, reversing the process with the photo on top of texture. Thanks so much for the texture and the new (derelict) theme. I have to admit, I had to look this one up lol! thank you very much for this information and the link. i appreciate knowing what reasons that there might be to update my program as well as finding alternate ways of accomplishing things. What photo editing app did you use? Photoshop or what, they are looking great. Good job. Besides, you can also use https://macphun.com/snapheal this app helps you to edit your photos effects and make it looks better. Try to but this app is only for the MAC users.